I cannot believe the semester is already over! It seems like only last week we were sitting around the table for the first time introducing ourselves and looking at the syllabus with perhaps a hint of fear at the thought of creating a weekly blog. Now look at us! I think we can say that, although we may not all be blog masters, we certainly have created some really great pages between or Deep History and Domestication blog and our animal research projects. After reading through everyone’s project, it seems clear to me that we all should be pretty proud of what we have accomplished in this class. Each animal was presented in a unique way, but in the end, all of the blogs did a phenomenal job at developing their specie’s domestication throughout history. And anyone with the slightest interest in domestication that stumbles across our main page is really in for a treat! This class was remarkably different from any other that I have taken in college, but it has certainly been one of my favorites! I came into this course with almost zero knowledge about animal domestication or its history and now I feel like I could teach a full course on it. It was truly phenomenal how much we were able to cover in such a short time together and it really is a shame that its coming to a close. I really enjoyed our discussions each week and I’m really glad to have met all of you guys. I wish you all the best in your future endeavors and hopefully our paths will cross a few more times, either at Tech or in the future. Dr. Nelson, I cannot thank you enough for all the work you put into this course. You really made this class fun while encouraging us to push ourselves and learn new things. I can honestly say that I would never have even considered blogging before this class and now I might even go so far as to say I enjoy it! The readings and discussions that you set up each week opened my mind to so many new things that I will carry with me forever. I look forward to taking more classes with you in the future and I hope that you continue to offer this class as long as you are teaching. It really was an awesome class and I think that everyone should be given the chance to take it! I will remember you all and this class for the rest of my life. It is astounding how domestication works its way into almost every subject and aspect of society, and I would never truly have known the all encompassing history of domestication without this class. I look forward to being able to expand my learning with this course as a basis, and I only hope that my future classes are half as great as this one. Thanks to all of you for making this a memorable semester! I think we had a really good session today and covered quite a range of topics. Not often do string theory and Korean politics get tied into a conversation about domestication but somehow we found a way. I feel like there was so much more to cover but you can only do so much in an hour and fifty minutes I guess. Anyways, I just wanted to see if I can get a post onto the mother blog to make sure whatever glitch happened on Sunday is fixed. See you guys next Tuesday. Charles Darwin has always been an iconic figure for me. His studies and conclusions have fascinated me for as long as I can remember. Along with Louis Pasteur as I mentioned in my last post, Darwin is among the scientists that really led me to pursue studies in the field of science. Perhaps the great beards have something to do with my appreciation for this pair, but the real reason that I like these guys is their complete dedication to their work and their major contributions to the field of science as a whole. No matter what it is that you want to be when you grow up, you will run across these names and I think that speaks volumes to their importance to mankind. Now that I have given that little background tidbit, I will attempt to bring up the interesting points from the excerpts from Darwin’s The Variation of Animals and Plants Under Domestication and Brantz The Domestication of Empire without too much bias hopefully. Overall, both readings were pretty good. I particularly liked reading Darwin, for reasons previously stated, but also because the ideas he discussed are so far ahead of his time in my mind. He made some very profound arguments with very little previous scientific discovery in the field of his studies. It is truly baffling to me how an idea like natural selection could be so soundly described without any knowledge of DNA or genes. Even though we have obviously proven that some of his ideas, especially pangenesis, were not quite right, there was a great deal of truth to many of his hypotheses that are still accepted today. In regards to The Domestication of Empire, Brantz did a really great job of highlighting the trends of civilization and evolution and how they influenced each other. I still am taken aback by how much domestication has influenced all aspects of our lives, and I really liked how the trend of civilization kind of blended with evolutionary studies to explain some of these influences. In addition, I must confess that I was left with a feeling of human selfishness after reading through this excerpt. It seemed that every new subject that was brought up whether it was the keeping of pets, or the development of animal protections, or the creation of zoos was, at its core, done primarily for human advancement. I will make this opinion more clear later in some of the questions that I came up with from this reading. Here are some questions that we can use to get the discussion going for Tuesday. Please feel free to comment on them here or just think them over before we get together. Darwin remarks that “Man has no power of altering the absolute conditions of life, he cannot change the climate of any country, he adds no new element to the soil…” and he then goes on to say that it is an error to speak of man “tampering with nature”. Does this statement still hold true today? Has man evolved to the point where we now have the capability to control many aspects of nature or are we still at the mercy of nature? We have altered climates with pollution and added fertilizers to soil and are in the process of being able to prevent natural disasters like hurricanes. Would Darwin still argue that man cannot tamper with nature? Darwin suggests that the natural change that organisms experience is analogous to that which humans are causing, meaning man can only use the variations which nature brings about to shape domesticated animals. With things like genetic engineering we are now able to take a bioluminescence gene from a lightning bug, and create a glowing mouse. Is this something that nature would be capable of? Or is the fact that nature provided the gene in the first place still in support of the idea that man is only able to use what nature provides? And in relation to this, is man or nature more efficient at creating new species. Is man more efficient at using variations in animals to make new sub species or even new species all together because of the speed by which we are able to breed animals for a specific trait, or does natures method of survival of the fittest still provide the gold standard for evolution? Has man eclipsed natures evolutionary abilities, or are we still far behind creating new species as efficiently as nature? Whether by nature or by man, everything from plants to animals to bacteria is constantly evolving. As soon as it seems that an organism is perfectly suited to its environment, its prey or predators get a slight edge, and the species must evolve once more. Do you think that a perfect species could ever be created? Or does the constant battle of organisms to adapt to changing environments prevent this from happening? Are humans the exception to the rule of natural selection? Can weak individuals thrive in our current society, and can the strong fail? Is the human race always getting better, or does the fact that the average lifespan of this generation is predicted to be less than that of the last evidence that we are declining? Darwin describes a point at which simple organisms halt development for an indefinite amount of time due to a fit with the simpler conditions of life. He mentions that “members of a high group might even become…fitted for simpler conditions of life; and in this case natural selection would tend to simplify or degrade the organization, for complicated mechanism for simple actions would be useless or even disadvantageous.” Could humans be undergoing some sort of degradation due to natural selection? Or does this idea not apply to the downturn, if one exists, in human evolution? 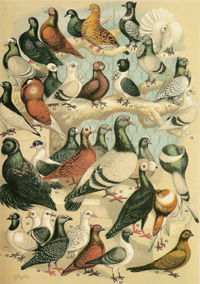 An entire portion of Darwin’s work was devoted to the study of pigeons. He discusses the many variations that exist between pigeons and how each of these traits has been altered by humans to create the hundreds of sub species of pigeons today. How long can pigeons continue to be altered like this? Is there a stopping point where a species can’t change further without being infertile or sickly? Or do they just change to the point that they become a new species altogether? Is human intervention resulting in the evolution or devolution of species like the pigeon? Do methodical and and unconscious selection actually hamper an animals fitness, or ability to succeed and reproduce, in many cases? Darwin presents some very interesting examples of artificial and natural selection working hand in hand. For example, he describes a species of pig in which black pigs are immune to a disease caused by a type of root that they eat while lighter colored pigs get sick. As a result humans select for black pigs artificially. Do situations like this, where artificial and natural selection work together result in “super animals” that would not have evolved without the combination of humans and nature? What is everyone’s opinion on Darwin’s idea of Pangenesis? Obviously, we know today that this is not the method by which reproduction and development occurs; however his method has many similarities to what actually happens. Do you think that his ideas in this book led to the actual discovery of our accepted theory today and does Darwin deserve credit for this? It really doesn’t seem to be too much of a jump to get from what Darwin proposes to what we know today. In The Domestication of Empire, it says that “while evolution brings humans and animals closer together biologically, the concept of civilization drives them further apart socioculturally and intellectually…”. Do you agree with this statement? I struggled with this idea initially but after reading the entire excerpt, I found myself more in agreement. Evolution really ties us all together, and the process of civilization does seem to place humans on a pedestal above everything else. What would civilization be like without domestication? Domestication has influenced everything in our lives from hierarchy to food production to transportation and I can’t help but wonder what things would be like if humans hadn’t taken those first steps toward domestication. How would things be different? Is it even plausible that domestication could have not happened? Was it predestined to happen? It was mentioned that domestication has its roots in the word “domus” meaning home. I found this to be pretty interesting because it makes sense when you think about the origin of the home. The home kind of develops from domestication because previous to the domestication of plant and animals people were nomadic and never really had a place to call home. After domestication however, people were able to settle down and call their place home for once. I guess this is more of an interesting thought than a question but we could discuss whether or not the idea of the home really does come from domestication. There was a lot of discussion of pets by Brantz which led into all sorts of topics from the cat vs. dog debate to dressing up animals to animal protection. All of these ideas presented some really cool information for us to discuss but since this blog is getting a little bit lengthy I will just ask a few questions and we can dig into the further in class. Do you think that people dressing up their animals and grooming them has an effect on the animal? Is the root of animal protection really just human selfishness, in that humans only protect animals to the extent that they are beneficial to us? Why do humans have such a strong desire for exotic pets? Three groups of animals are mentioned in the reading: animals as servants, animals as children, and animals families as human families. Do these same divisions still exist today or are there more or less? Are zoos a good or a bad thing? Can domestication be viewed as an improvement of animals as Cuvier suggests? Well there are some questions and ideas to chew on for the next couple of days. I look forward to hearing what you all have to say in the comments and on Tuesday! Kessler’s journey from the suburbs to a life revolving around a small flock of goats was truly astonishing. I have had very little experience with farms in my lifetime as I have mentioned in past blogs, which made this account especially eye-opening for me. I have always lived with the story book idea of a farm being a simple happy place where plants and animals and people all live in harmony. Over time I came to understand that it wasn’t quite so simple but I never really knew anymore than the fact that farm work is often hard work. After reading Kessler’s account in Goat Song I got a small taste of what life really is like on a farm today. As I was reading, I felt like I was taking the same journey as him, minus the fact that he did all the work and I never left the couch. It really sparked my interest and I must say I got sucked into to the day to day happenings and the well-being of Lizzie, Hannah, Nisa, Pie, Penny, Eustace Tilley and the other kids, neighboring animals, and Lola. Kessler did a phenomenal job weaving together his experiences on his farm with historical information, facts, and ideas. I really enjoyed the small breaks from his story to explain the origins of various words, or describe a cheese-making process or recipe, or tell another side story related to the happenings of his own life. It really kept me interested in the story and broadened my knowledge in ways that I would not have expected from a book about goats. The whole process of caring for and raising a herd of goats was unbelievable. The amount of work that was put in from the initial selection of a few individuals, to breeding, to milking, not to mention all the care-taking duties really explains the term kid for baby goats. It was like having kids! It is a 24/7 job that encompasses joy and love and fear and sorrow and so much more. As I started getting into the book, I began to get a feeling that it might be a lot of fun to have a couple of goats of my own, but the more I read the more I realized that I have enough difficulty taking care of myself that to throw on the many responsibilities and tasks of just a couple goats would be an impossible mission. But the feelings Kessler describes through the process make the whole journey seem very appealing, even with all of the hard-work involved. Throughout the reading, there were many subjects that caught my attention and peaked my interest. The many explanations for the origins of words and terms we use today were especially appealing to me. I have always loved learning where some strange phrase or term we have comes from, and Kessler seems to share my interest. I did not realize how much of our language can be attributed to goats and early pastoral societies. From words like scapegoat and panic to the letters of our alphabet, goats and the lifestyles surrounding them have played a significant role in our communication to this day. I have always wondered exactly where a word like scapegoat originated, and after explaining the background of the historical feelings towards goat, which seemed very negative at times, and their sexual habits and ties to the devil and of their being cast out into the wilderness, terms like scapegoat and panic make a lot of sense. In addition, I found Kessler’s discussion on the biochemistry of cheese to be really intriguing. I have never really been a fan of cheese, and have never looked into the different processes used to make the large variety of cheeses we have today, but after reading the section on all of the organisms and compounds involved in the art of cheese making, I can’t help but get drawn in. I had never even considered how the diets, lifestyles, and surroundings of an animal would play into the end cheese product. Cheese was cheese to me, but now I can’t help but picture all the little grasses and bacteria that went into each slice. Cheese is like a snowflake; no two pieces are alike. I definitely plan to read more on the art of cheese-making. Kessler also managed to weave in a few references that tie into our discussions of domestication. He touched on the idea of haves and have-nots briefly at one point, and I couldn’t help but see the connection to Jared Diamonds central theory in Guns, Germs, and Steel. In addition, he hits on what it was that made certain animals susceptible to human domestication, while others were not. Amongst other reasons, he mentions dominance hierarchies, diet, and flight response, all of which were central to Diamonds’ ideas. I don’t know if he borrowed these ideas from Diamond or from some other source, but it is very interesting to see how all of our readings seem to tie together when they seem so different on the surface. There are so many great topics to discuss in this book, but I will save the rest for Tuesday’s meeting. I hope the rest of you enjoyed this book as well and I look forward to hearing what everyone else has to say! This weeks reading from Vitebsky’s The Reindeer People falls into a slightly different category from the other pieces we have covered so far this semester. It wasn’t a compilation of research and studies that were constructed into a foundation for some overarching idea about the origins and definition of domestication like we saw with Diamond and Bulliet. It was simply a story. Vitebsky discovered a group of extraordinary people who were so unique from the everyday masses, and he set out to tell their tale. He definitely has his own opinions and theories weaved into the web that is the reindeer people’s life, but for the most part he allows his experiences to speak for themselves. As a result, I found it very easy to just sit back and enjoy myself while I read about the Eveny and their exceptional way of life. There were a plethora of intriguing ideas throughout the portions of this book that we covered, but, for the sake of a post that is shorter than the work itself, I decided to focus on just one of these topics. I thought it was fascinating how the Eveny people placed so much value and faith in the actions of animals, both wild and domestic. The concept of Bayanay and of the close spiritual connection of the people and the animals and the land and even possessions like knives and guns seemed like such a foreign idea to me at first glance. However, as I continued reading I began to see many parallels between the Eveny’s cultural ideas and our own. This may seem like a strange connection at first but I will do my best to explain myself. The first interesting overlap that hit me was in connection to our modern cinema. The whole idea of Bayanay and ever-present spirits is very similar to the views of the Na’vi people of Pandora in the movie Avatar. I thought this was a very interesting connection because in the movie the idea of our “connected-ness” to nature was portrayed a strange and foreign, yet the Eveny people are an example of human beings who have extremely similar views on nature. As I compared the movie and the book, I began to see so many similarities between the two that I started to wonder if maybe Vitebsky and James Cameron had gotten together at some point wrote the movie together haha. I won’t go into too much detail about it all because I feel like I am straying off topic, but just to provide some examples; the mining of unobtainium on Pandora vs. the mining of precious metals by Russian miners in the Eveny territories of Siberia, the close ties of people to animals which is taken so far as to be a literal connection between the Na’vi and the species of Pandora when they intertwine their braids with the animals the are riding, and the pressures of invading individuals on maintaining an established culture (communist Russians for the Eveny and humans for the Na’vi). Another interesting thought I had had to do with the Eveny use of reading into animal symbols to see the future. There were many examples throughout the text of Eveny people seeing strange behaviors of animals as omens for things to come. For example, Kesha tells a story of a swan landing on a lake in front of him when he was out hunting one day which he later took to symbolize that he would meet his wife Lyuda. At the time, there was no way that Kesha could have known what the strange swan sighting was meant to symbolize, if anything at all, but it so happened that an event in the future (the meeting of his future wife Lyuda) made the symbolism of the swan evident. I couldn’t help but think of a fortune cookie when I read this story. A fortune cookie is a seemingly meaningless phrase at first, but as the future unfolds, an event often occurs that seems to validate the fortune. For example, you might get a fortune that says “A pleasant surprise is in store for you” which makes no sense until your old friend from grade school surprises you with a visit a couple weeks later. This struck me because it shows a sort of similarity between our culture and that of the Eveny people, when on the surface there doesn’t seem to be anything even remotely similar between the two groups lifestyles. I continued to think about this concept and a thought provoking question hit me. Do these animal signs and fortunes that we come across in everyday life cause us to act different subconsciously as a means of fulfilling whatever it is that we think the sign represents? Or to word it another way, do we make different choices than we might normally have because we have a lingering feeling in the back of our heads from the strange swan we saw or open-ended fortune we read last week? In relation to the book, there is a story about a girl, I can’t remember her name at the moment, who finds an Eveny knife and is told by those around her that she has actually found a husband because the knife often symbolizes this. It turns out that she does end up marrying an Eveny man in the future. To tie this into my question, does the fact that she found an Eveny knife make her more likely to give Eveny men more of a chance in the future, while at the same time blocking out attempts by Russian or Sakha men? I suppose this wasn’t really the type of question Vitebsky was trying to get us to ask but I thought it might be an interesting discussion all the same. The last two parallels that I thought of between us and the Eveny peoples had to do with their ability to see the future in dreams and their lack of telling people about a good omen in a dream for fear that it won’t come true. In relation to the first parallel, I think that the ability to see the future in a very ambiguous form, like in Varya’s story about how she dreamt that she was walking next to a river in a strange place with her sister-in-law making a garland of flowers which ended up coming true when she was brought to see her dead brother, could be described in our society as déjà vu. The idea that you have already experienced the present at some point in the past happens to many people, and this may be what Varya is describing here. Maybe we all have some deep connection with nature and the Eveny people have just realized it to a larger extent than others which has led them to their different way of life. Finally, my second parallel about the fear of spoiling a good omen seems to relate to the idea we have about not “jinxing” things. In a conversation Vitebsky had with one of his many Eveny friends, the idea of keeping a good omen secret until it comes to pass is brought up. Vitebsky is told that telling someone else of a good omen will cause it not to come true. This is similar to when someone today predicts a positive outcome and is told “Don’t jinx it!” No matter whether you live in a cabin in Siberia or an apartment in Blacksburg, there is a natural fear of spoiling a good thing by voicing it too early. Are we all subconsciously worried that we will offend Bayanay if we get too cocky? Well, I may have gotten a little carried away there and I apologize if I swayed off of the domestication topic, but I think we have all come to realize that nothing is really too far off the mark in this class, haha. To summarize the meanderings above, I just think that maybe at heart, we really aren’t all that different from the Eveny people, we just have a different way of explaining natures phenomena.